Afghan forces killed at least six civilians in ground and air operations on Thursday in eastern Nangarhar province, which has witnessed heavy fighting in the last two weeks. Afghan forces killed at least six civilians in ground and air operations on Thursday in eastern Nangarhar province, which has witnessed heavy fighting in the last two weeks, a spokesman for the provincial governor's office said. The attacks in the Khogyani district of the province also wounded four civilians, spokesman Ataullah Khogyani said. An Afghan military official said an investigation was underway to determine if and how the operation resulted in civilian casualties. Both Taliban and Islamic State militants are active in eastern Afghanistan. "A farmer and a security guard were among the dead. A mosque and 21 vehicles were damaged during the bombing," Khogyani said. Earlier this week, gunmen attacked an education department office in the eastern Afghan city of Jalalabad and held out against security forces for four hours before the assault ended with at least 10 people killed. It was the third major attack in less than two weeks in Jalalabad, the main city in Nangarhar province, following a blast that killed a group of Sikhs on July 1 and a second that killed at least 12 people this week. The fighting comes despite speculation about possible peace talks between the government and the Taliban, with calls from a special religious council meeting in Saudi Arabia this week for negotiations to end the 17-year conflict. 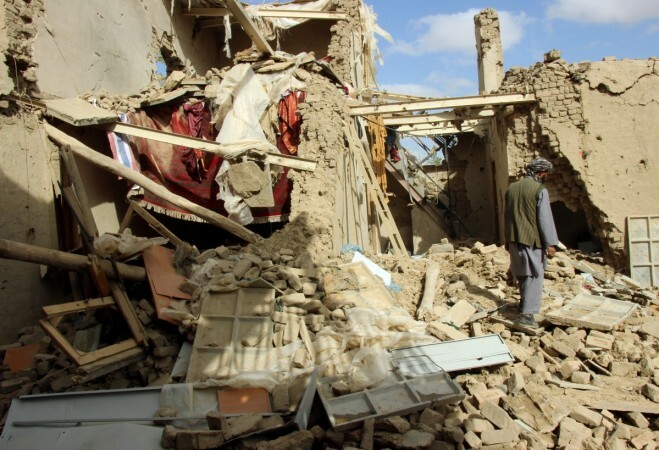 The United States last year stepped up air strikes as part of a strategy to force the Taliban to the negotiating table and commanders to say that together with the fledgeling Afghan air force, the campaign has inflicted heavy casualties on the insurgents. Human Rights Watch in its latest report called for impartial investigations into airstrikes causing civilian losses. Last year, more than 10,000 civilians were killed or wounded in the war between Afghanistan's Western-backed government and the militants, down nine percent from the previous year, a report by the UN Assistance Mission in Afghanistan said in February. The Taliban are fighting to restore strict Islamic law after their 2001 ouster at the hands of US-led forces.